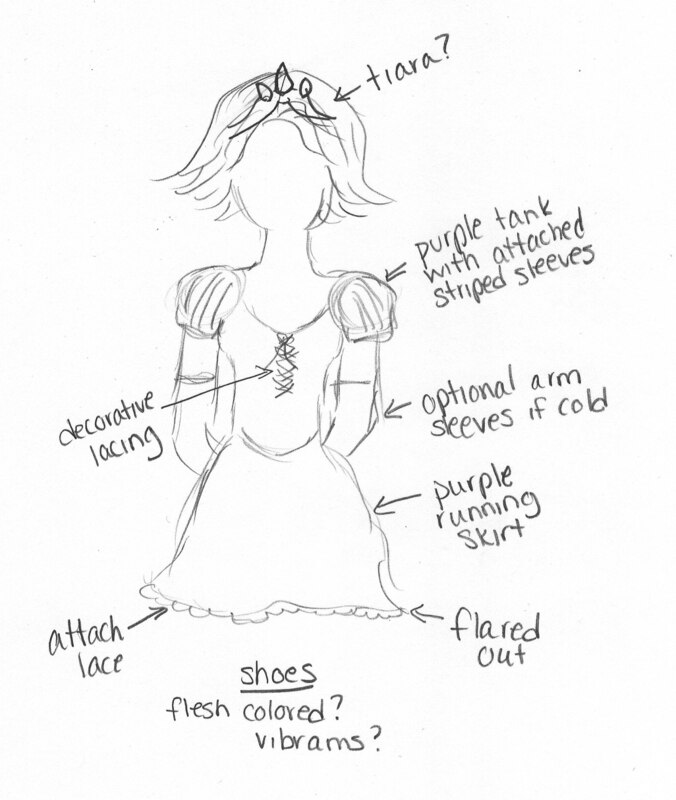 WDW Half Marathon: Costume Design! So I was pretty excited to find out that a lot of people dress up to run in Disney’s marathons and half marathons. I pondered for a few weeks about who I could dress up as. I didn’t want to wear a wig to run in, obviously, so I wanted to go with someone who had naturally brown hair. Preferably pulled back or short. Snow White was obvious, but everyone seems to do Snow White. I considered Belle and Jasmine. And then one afternoon it occurred to me: Rapunzel, after she (spoiler alert!) has her hair chopped off at the end of the movie is a short haired brunette! And it wouldn’t be a difficult costume to turn into a running outfit. Now I can be on the lookout for running gear that I can modify to turn into Rapunzel! In fact, a preliminary google search for flared, purple running skirts turned up a Rapunzel skirt by SparkleSkirts! My biggest question mark is around shoes right now. Since she is always barefoot, I’d want something with a barefoot look. Probably flesh colored minimalist shoes, if any exist. Vibrams (the shoes with the five separate toes) would be awesome, but I don’t know if I’m ready to go that minimalist, especially in a half marathon. Should I just go with some matching purple shoes? This entry was posted in Fun Stuff and tagged costume, walt disney world half marathon. Bookmark the permalink. I need to let my wife read this. She is looking to do the Half in Feb.